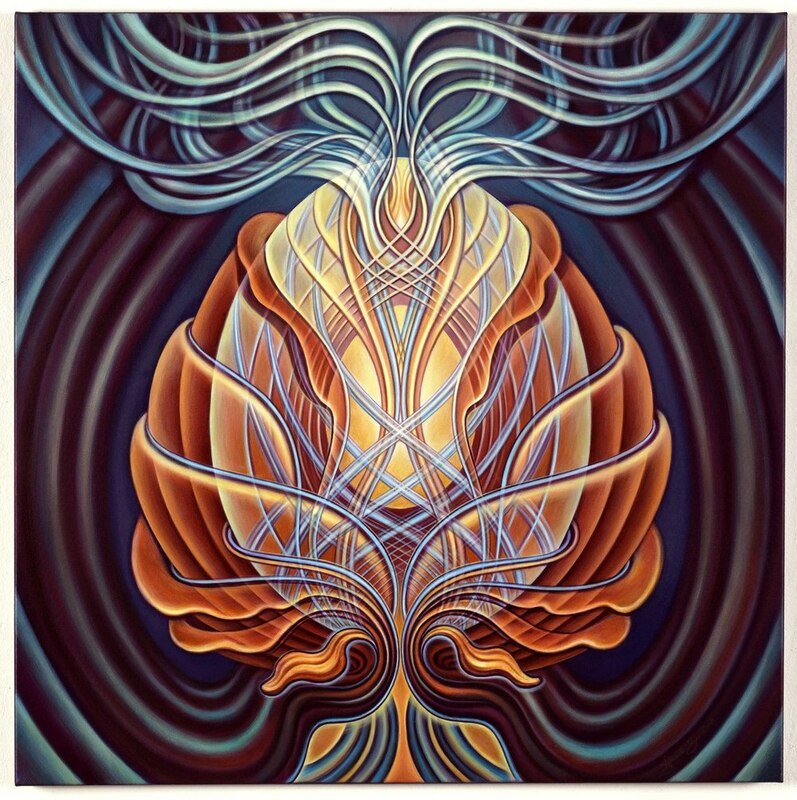 Amanda Sage is at the forefront of a new breed of visionary/interdimensional artists using art as a tool for personal, spiritual, planetary growth and transformation. Amanda was born April 19, 1978 in Denver, Colorado to her mother YOU and father Jackson, with two brothers still to come. Her childhood was filled with healthy, tropical, media-free, creative freedom in Florida without the distraction of formal schooling until she entered 4th grade in Colorado. After finishing high school in Boulder, Colorado in 1996 at the Shining Mountain Waldorf School (where ‘coincidentally’ her high school art teacher was the Fantastic/Visionary artist HIKARU, her travels and projects bounced her between Bali, Indonesia and Vienna, Austria. Sam Bull from Leap Now helped guide her in connecting with the revolutionary midwife Robin Lim in Bali, and initiating the first contact with the artist and teacher Philip Rubinov Jacobson. After graduating she went to Bali as a volunteer for close to a year, and amongst other projects & exotic distractions, illustrated an herbal book with over 70 indigenous plants and herbs for the natural Birthing Clinic, now called Bumi Sehat. In this time she also extended production of her Batik clothing and design project that she had started in high school with her dear friend Leilea Satori, and this continued on amidst bouncing around the globe between the US, Vienna and Bali till the year 2000. Following this in 1999 Michael introduced her to his father, internationally famed godfather of Fantastic and Visionary Art, Ernst Fuchs and has since been a student and painting assistant on various projects throughout Europe. Michael taught her to “see” the world around her through the brush and the Old Master techniques in painting. Ernst has reminded her to “listen”, which has opened up other ways of ”seeing” and perceiving. Since 2000 Amanda has been blessed with sharing a beautiful studio in the WUK, a self-governed culture house in Vienna (the biggest one of it’s kind in Europe), with her friend and colleague Paula Aguilera Pacheco a sculptor, painter and animator originally from Chile. The WUK has been an amazing playground for learning, creating and discovering new systems of group-interaction and presentation. She served for 2 years as a member of the Board of Directors of the WUK, and then for 6 years as Administrator of one of the major sections of the studio’s and workshops together with Paula, as well as initiating and organizing various events the largest being the ‘MAZE’ an open studio’s event in 2005 & 6. This has provided her with community, as well as space and time to discover her own visions, share questions and absorb information. She has exhibited Solo and in Group Shows in Galleries, Salons and in various projects/events worldwide since 1999, including London, Vienna, Munich, Berlin, Bali, Colorado, Seattle, San Francisco and most exotically at Burning Man , hanging next to renowned visionary artists and friends such as Alex Grey & Allyson Grey, Martina Hoffmann, Robert Venosa, & many amazing artists involved in the growing movement of Visionary Art. Amanda is currently represented in various galleries & online collectives such as the Tribe 13, which has been bringing visionary art to festivals & gatherings worldwide for over 10 years. The Temple of Visions, a Gallery & Sacred Space in dwntwn Los Angeles; the Galerie 10 in Vienna, as well as the Beinart.org collective that has been exposing unknown artists from all over the world through the boundlessness of the internet. Since 2009, Amanda has been primarily based in Los Angeles where she has been featured in many group exhibitions, collaborating in various art projects and LIVE painting at many events. She has also made her debut teaching at the annual Visions in the Misch Technik Seminar in Italy, with noteble artists Laurence Caruana, A.Andrew Gonzalez & Maura Holden. She also offers a five day intensive called ‘Painting with Light’, held so far in Colorado & Chicago with the 3rd coming up in Vienna, Austria this October. Her work is also featured at the Phantasten Museum in Vienna Austria, a new museum for Fantastic & Visionary Art that opened in January 2011. The Kirkland Museum in Denver, Colorado is host to a few of her pieces, as well as various international private collections.